Every day that you spend in your beautiful new French Country home is like a trip to the wine region of France! 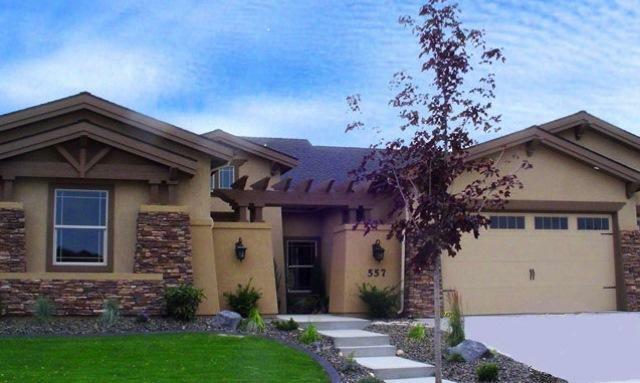 A courtyard entry greets you in this amazing 2 story, 4 to 5 Bedroom, 3 Bath home. The luxurious Master Suite will pamper you with its many features at the end of a hard day. 2,850 sq. ft. The focus is on Indoor/Outdoor living at its finest, featuring a large courtyard entry. This breathtaking and up-to-date design is perfect for entertaining as well as everyday living. Pamper yourself in the large Master Suite and there are Flex Rooms for those with specific requirements. 4 Bedrooms, 3 Baths. 2,650 sq. ft. This stunning new design is loaded with fabulous architectural amenities! This 4 Bedroom, 2 Bath home was designed for indoor / outdoor living at its best. Enjoy 12' ceilings in the Kitchen and Great Room as well as views to the rear courtyard. 2,375 sq. ft. Incredible Cottage Design, Incredible Price! Talk about great curb appeal! This charming cottage home is designed for today's active lifestyles. With 3 to 4 Bedrooms and 2 to 3 Baths, this wonderfully affordable home has it all. This flexable design offers several room options including a Media Room in lieu of the Dining Room. A 3 car garage is standard. 2,175 sq. ft.
"The Riviera" features a stunning new 3 to 4 Bedroom plus Office single story design with great curb appeal and surrounded by beautiful homes in a quiet, low-traffic neighborhood. Inside, you won't believe your eyes when you see all the features of this unique and affordable home. This plan is the 3 car tandem garage version of our Riviera Plan which fits nicely on narrow lots.